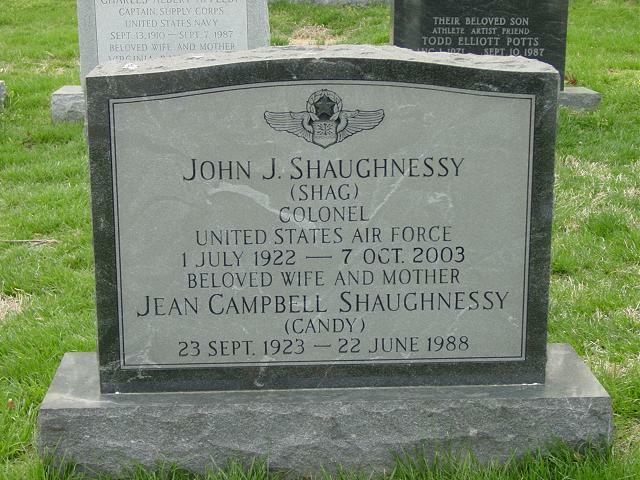 John Joseph "Shag" Shaughnessy, 81, a retired Air Force Colonel who after serving as a legislative liaison officer at the Pentagon taught automotive sciences at Northern Virginia Community College, died October 7, 2003, at Walter Reed Army Medical Center after a heart attack. Colonel Shaughnessy began his 30-year military career as a radar operator with the Army Air Forces during World War II. Attached to the 454th Bomber Group in Italy, he flew in B-24 Liberators on missions over Germany. After the war, he was stationed in Oakland, California, where he served as liaison to the Navy and logged more than 600 hours as a crew member on the giant JRM-1 Mars flying boat. In the 1950s, he was in Washington with the 1254th Air Transport Wing, which provided overseas transportation for members of Congress. After serving as a procurement officer in Taiwan and Hawaii, he returned to the Washington area, where he was assigned to the office of liaison of the secretary of the Air Force. He retired from active military duty in 1972. Colonel Shaughnessy, who graduated from the University of Maryland and received a master's degree in business administration from George Washington University, pursued an interest in how cars work. He received six associate degrees in automotive sciences at NVCC and taught automotive technology courses at the community college's Alexandria branch in the 1970s and 1980s. He also helped organize military reunions as president and chairman of the board of the 454th Bomb Group. Colonel Shaughnessy, a Springfield resident, was born in Watertown, New York, and raised in Coral Gables, Florida. His military decorations include the Legion of Merit, the Distinguished Flying Cross and the Air Medal with three oak leaf clusters. His wife, Jean "Candy" Shaughnessy, died in 1988 after 42 years of marriage. Survivors include two daughters, Cynthia Shaughnessy of Washington and Erin Frey of Rhoadesville, Virginia; two brothers; and two grandsons. A 40-year resident of Springfield, Virginia, died October 7, 2003. Beloved husband of the late Jean Campbell (Candy) Shaughnessy; devoted father of Cynthia Z. Shaughnessy and Erin S. Frey and her husband John G. Frey; dear son of the late Martin W. and Norma D. Shaughnessy of Watertown, New York; loving brother of Robert W. Shaughnessy of Fort Myers, Florida and George Durant Shaughnessy and his wife Marge Shaughnessy of Haines City, Florida and their families; and grandchildren, gregory John frey and Patrick Joseph Frey. Also survived by his long time companion Harriet Lee Levine and by his dear friends and their families of the 1254th. Services at the Old Post Chapel, Fort Myer, Virginia, on December 1, 2003 at 10:45 a.m. Interment will follow at Arlington National cemetery. Expressions of sympathy in his memory may be made to the local chapter of the Kidney Foundation or the American Heart Association.